American Alligator Belly - Black Suede Garment | Buy Exotic Leather Skins and Hides Online in the U.S. with Roj&eacute; Exotic American Leathers. Custom colors and finishes in 6 weeks or less with only 5 skins per color. Thousands of high quality Crust as well as lower grade crust at reduced prices. EU clients need double verification allow up to 30 more days. We can also produce your bespoke bags, samples, semi production or full production for your line at our U.S. workshop. Differences between A and B can be very subtle. We do our best to have very clean skins to ship our clients, with a high cutting yield regardless of A or B classification. In today's market conditions there are very few A classification skins by our grading or judging eye. Most all A classification skins, which comprise of 10-15% of all those skins available throughout the globe are pre-sold or allocated to European Fashion Houses, sometimes as early as an egg state. These Houses have done a very good job of traveling the world to farms, hunting grounds, and tanneries to secure these skins for their own production. These Houses have become vertical and either fully own or own large percentages of farms, tanneries, and even distribution companies, in essence they have nearly cornered the global luxury crocodilian (all species of alligator and crocodile, excluding caiman) market. We have been trained to select the best B classification skins with the highest cutting yield to stock and ship to our clients. We then do our best to train our clients how to creatively cut around or design around B classification skins, or show the authenticity of the skin by leaving these badges of charter shown. With a bit of creativity and effort also comes rewords for ones effort as the price ranges from an A to B classifications can be up to 50% less depending on how, where, and when we purchased our raw material. There is often a misconception that a B classification translates into a skin with weak tensile strength, a Swiss cheese effect, or damaged in some other way. Quite the contrary, actually what constitutes a B classification is a small cosmetic surface scratch or natural scare that is less than perfect. Many buyers of the finished products we produce luxury goods for within our industry prefer less than perfection as symbolic of genuine or authentic crocodilian. This symbolic stamp of authenticity has recently become important as the faux, stamped, and embossed cow leather tanners have gotten really good at producing look a likes with a perfect pattern repeated across a full cow hide. This is also how one can spot embossed or faux crocodilian products from the real deal. Please note that the industry standard for classification of A, B, or C grading is solely between the front arms and hind legs or the center belly only and not the tail or throat region of a crocodilian skin or the outer bony area of a belly if 3rd/4th/5th rows of bones where left intact during the skinning process. Know the width you need before making a purchase. We want you to have a smooth and hassle-free experience shopping with us. Our staff have over a decade of experience in working with exotic leathers; if you are not sure which size or quantity of skins you need for your project, contact us prepared with the measurements of your pattern so we can assist you with obtaining the right amount of material. 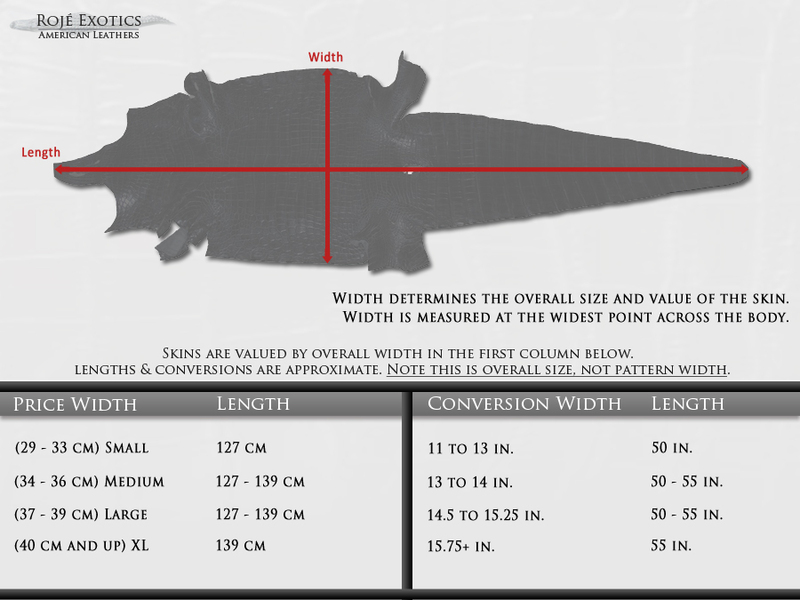 In addition, look at our sizing charts and have realistic expectations. Always give yourself a bit of seam allowance and wiggle room. Alligator skins are protected by US Laws and CITES Appendix II. They are legally traded, bought and sold in the United States and most countries abroad with the proper paperwork. Currently, there are approximately 200 alligator farms in the United States. These farms (sometimes called banks or rehabilitation projects) are funded by tourism, grants from local governments, donations from conservationists and the hunting and CITES tag system. Other farms have a closed, sustained system for raising and supplying skins to the alligator leather trade, although some also get revenues from tourism. The popularity of the American Alligator, the value of its skin, and the conservation efforts leading to the reintroduction of the species into the wild has enabled the American Alligator to make an amazing comeback since their near extinction status in the 1970's. Today, millions of alligators are living in the wild or in such farms and rehabilitation projects in the Southeastern United States.